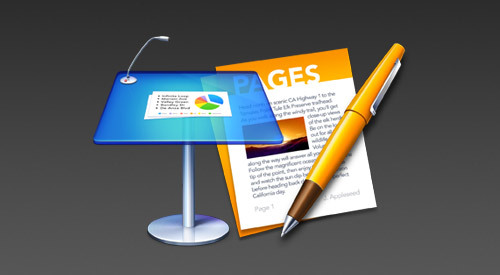 The iWork apps received a long-rumored update in late October alongside the Mavericks OS(10.9) rollout. The apps have lost their year-based designation, going back to versions numbers across the board (Keynote 6.x and Pages 5.x, respectively), and each require Mavericks (10.9). While at casual glance they look to be UI/feature-oriented updates, the underlying unifying architectural changes are quite major, and have introduced a number of issues using themes or templates built for the '08/'09 applications in the newer apps. The newer applications are billed as a "complete rewrite," and for good reason. Beyond the single-window UI orientation changes, the apps have moved to a unified file format for desktop, web and mobile underneath - resulting in the loss of a number of features you've likely become accustomed to on the desktop to accommodate the simplified cloud-centric workflow. This article represents a summary update of our prior blog posts on the upgrades - please refer to the Updated iWork Apps are Here post for additional background information. Keynote 6.x Click-Installers have been posted for all of our Keynote 6-compatible themes - you'll find these listed alongside the traditional iWork '08/'09 installers on the downloads page for each theme. We'll soon be updating each theme page on the site to note Keynote '09/Keynote 6/iOS compatibility on a per-theme basis in the Options column - in the meanwhile, all themes listed in the "Keynote Themes (6.x/'09)" section of the All Themes page now include a corresponding Keynote 6.x Click-Install package optimized for the new version. Themes that are additionally compatible with the extended iOS/iCloud ecosystem are now shown on the Keynote 6 / iOS Compatible page. Nearly all of the '08/'09 catalog was updated for 6.x - Video and Kinetic themes (Brighton Motion, Fuse and Canto) remain incompatible at this time, and Keynote 6 offers no support for the older mask-based theme paradigm, so Pavilion '08 and a number of now-retired Classic Keynote themes did not migrate to 6. More information is available in the Keynote 6 Click-Installs are Now Available post on the blog. As noted on the Updated iWork Apps are Here post, Pages lost a number of key features in the upgrade, with Page Layout Mode, Insert Pages/Sections and Mail Merge disappearing entirely in favor of the very simplified template approach used in the iOS app. *All versions* of our Pages Template packages are incompatible with the new Pages 5.x architecture and have been subsequently discontinued. We urge all customers relying on any of our Pages Template packages to retain Pages '09 for full operability until such time as a way forward becomes apparent. Documents you save from Pages '09 can (usually) be opened in 5.x, though you lose all of the backing template pages in the process - so add all the pages/sections you're going to use while in '09, save, and open the resulting file in 5.x for light editing/printing etc, or as needed for compatibility. We have no plans at this time for supporting the newer, more limited template architecture introduced in Pages 5.x (or, as many of you have written to suggest, Microsoft Word - though they're quite similar now in terms of what constitutes a document template). We're continuing to evaluate options for comparable alternate software packages in the meanwhile, and will likewise continue to monitor Apple's Features and Compatibility roadmap as the product continues to evolve. We'll be continuing to support Keynote 5.x alongside Keynote 6.x for the time being - all new theme releases for the foreseeable future will support both installation types. Keynote5.x-only themes are now considered Classic - no new Keynote 5.x-only themes will be released.